Utrecht Natural Chungking Pure Bristle Brushes are handmade using only the highest-quality natural Chinese Chungking Hog Bristles. The naturally curved bristles in these brushes are cupped with interlocking construction, which provides better control and excellent shape retention. The tips of the hairs are flagged or split, promoting even strokes and superior paint-holding capacity. The naturally strong, stiff bristles make Utrecht Series 209 brushes ideal for use with heavy-bodied acrylics, oil paints, and for impasto brushwork. The nickel-plated seamless ferrules are securely fastened with deep double crimps onto long brown hardwood handles. 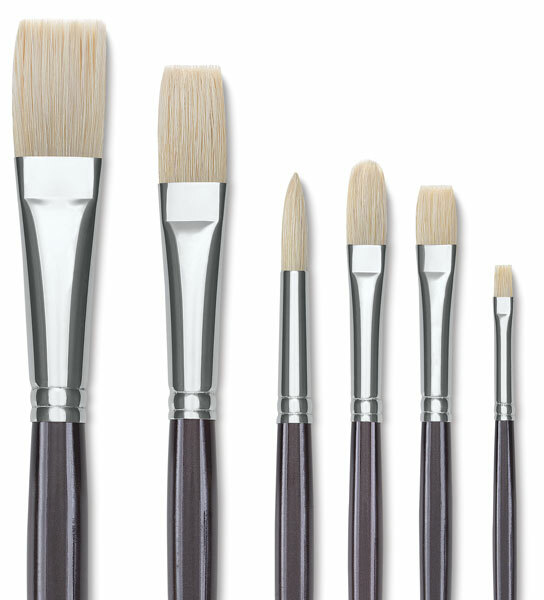 Set of 4 — This brush set includes a versatile selection of four outstanding Natural Chungking Pure Bristle Brushes. It includes a Flat #10, a Flat #12, a Filbert #6, and a Round #4. 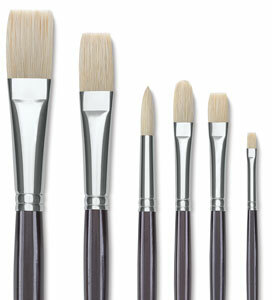 This brush set is great for an oil or an acrylic painter.